Rep. Charles Rangel, the head of the House tax-writing committee, admitted Wednesday that he owes about $5,000 to the Internal Revenue Service for failing to report income on his returns. But Rangel, D-N.Y., asked colleagues to let the ethics committee investigate and urged Republicans to stop trying to have him removed from his post. As House Ways and Means Committee chairman, Rangel has a powerful say over tax law changes. By his own admission, he has no excuse for not reporting years worth of rental income on a beach vacation property he owns in the Dominican Republic. "Mistakes. We all make 'em. We all have to say we're sorry, but we all don't have to attack each other," Rangel said. House debate over the matter turned personal when he said GOP leader John Boehner, did not really have his heart in it when he and other top Republicans called for Rangel to be removed as chairman. Boehner, R-Ohio, then rose to deny that claim. "My intent here is not to claw at my friend from New York. My intent here is to have justice and to have all of us live by the rules of the House. I'm sorry that I had to do it but I have a job to do on behalf of my colleagues," Boehner said. The exchange capped a day on which Rangel admitted embarrassing mistakes in his personal finances but insisted they were innocent errors of omission, rather than acts of deliberate deception or greed. Those errors, he said, would be corrected in amended filings to both the IRS and the Congress. "I really don't believe that making mistakes means that you have to give up your career," the lawmaker, who has spent nearly 38 years in Congress, said in a lengthy talk with reporters. Rangel's total back-tax bill will likely be something approaching $10,000, after factoring in state and local levies, his lawyer said. The 78-year-old Rangel maintained that over the course of two decades, he simply did not know the details of his mortgage on the beach property, how much rent he received from it or that the rent should have been reported. He blamed the confusion in part on language and cultural barriers with the operators of the resort. But according to The New York Times, that could be greeted with skepticism by some of his constituents since Spanish is the primary language in nearly half of the households in his district. And Rangel's own Congressional Web site can easily be translated to Spanish, reports the Times. Rangel did say that Democratic and Republican lawmakers had stayed as guests at the beach house; he declined to name them. 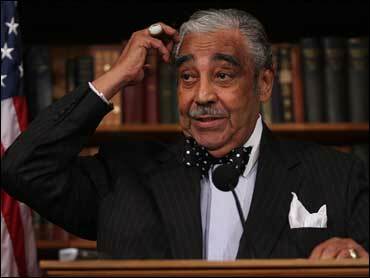 "As chairman of the Ways & Means Committee, I am held to a higher standard of propriety," Rangel said. Asked if he had lived up to that standard, he replied: "Of course not." Republicans are trying to use Rangel's mistakes to show that Democrats cannot claim higher moral ground on issues of ethics and corruption. The spokesman for the House Republican campaign committee, Ken Spain, said Rangel should "go on a permanent vacation and trade his powerful committee chair in for his favorite lounge chair on the beach." The ethics panel is examining Rangel's unusual deal for the beach villa, as well as three rent-stabilized apartments he uses in his Harlem district, and a series of letters he wrote seeking support for a New York education center named after him. Rangel purchased the beach house in 1988 for a price of $82,750, with a down payment of $28,900 and a mortgage of $53,850. Over the next 15 years, he did not make any payments directly for the mortgage, but the managers of the resort property used rental income from the property to gradually pay down the mortgage. During all but two years of the mortgage, Rangel paid no interest on it. His lawyers estimate he failed to report some $75,000 in rental income over a 20-year span, but that only posed a tax problem for the congressman when he sold a residence in New York City four years ago and his tax liabilities briefly changed. The ethics committee is also set to examine how Rangel came to rent three rent-controlled units in his Harlem district, as well as his use of official congressional stationery to try to attract potential donors to a college center named after him.